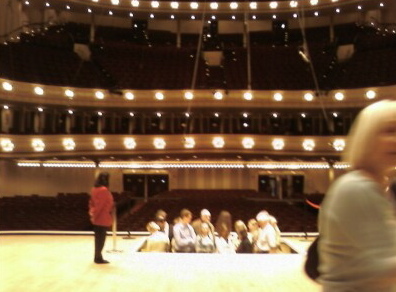 Yesterday I took a backstage tour of the CSO. It lasted about an hour and took us on, over, behind, and under the stage. 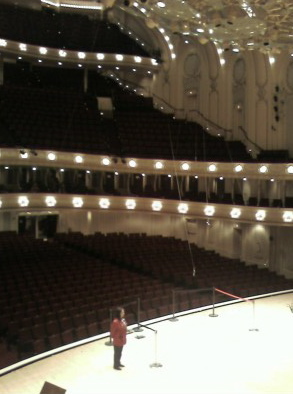 This is a view of the stage from the box seats, a section of the hall I’ll probably never sit in again. ($$$$) The roped off area front and center on the stage marks off the elevator in the floor that’s used to raise and lower the grand piano to and from the stage. The highlight of the tour was riding the lift down from the stage. This is a crummy shot of another tour group taking the elevator down. If you’ve ever been to a performance where the piano is removed halfway through the evening, you’ve seen the stage hands push the piano to the square in the floor that lowers while a yellow light flashes. 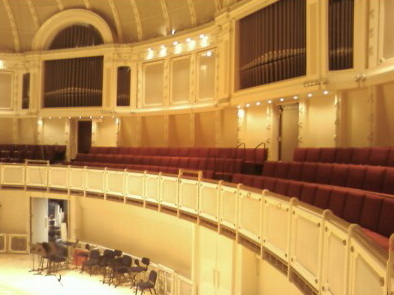 Once down below, metal doors open onto an underground storage area with parking places enough for the three grand pianos the CSO has in rotation. Visiting performers are given their choice of instrument to use. 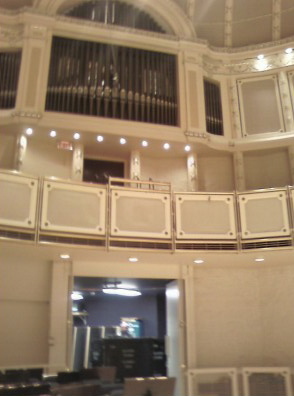 The pipe organ is also stored there and moved to the stage in the same way. The basement of the building contains the dressing rooms for orchestra members, including private rooms for the first violinist and first cellist. The conductor also has a suite of rooms, which seriously, has all the charm of a college common area. There are practice rooms, offices, archives and quiet rooms, where members of the orchestra can go to meditate, read, catnap, whatever, as well as a lounge with computers and a pool table. Apparently CSO members are big pool players and a table is made available for them whenever they’re on the road. None of this were we able to see. 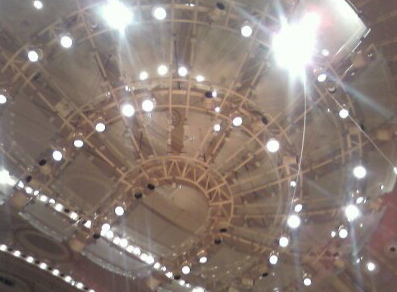 We climbed out of the basement using a stairway used by the orchestra to get to the stage. You could tell because all the handrails were rapped in foam, all the better to protect your 200-year-old violin on your way to the stage. 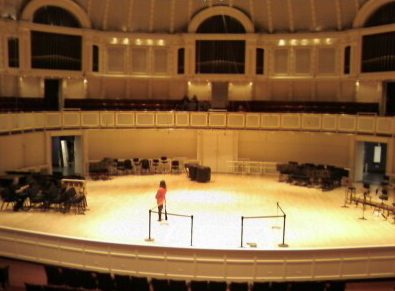 Things were loud directly behind the stage (which is about the space of a wide hallway and curved to follow the shape of the stage wall) as men were unloading crates of music stands and equipment, the CSO havng just returned from a tour in NYC. 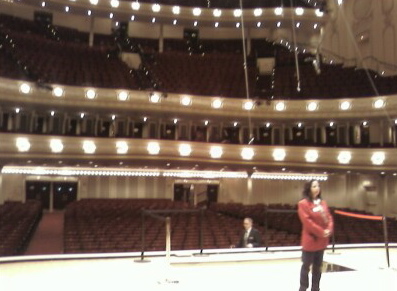 The view from the stage is quite spectacular. It somehow feels smaller and larger at the same time. The hosue seats seem much closer and shallower in depth than it feels when your sitting in them–except for seats in the gallery. Just as it feels like you’ll topple out of your seat and onto the stage if you lean too far forward when you’re sitting up in the nosebleed section (the slope is very steep), when you look up from the stage, it appears as if the gallery section is nearly at a vertical and ready to fall forward. The acoustics are notable when you’re on the stage and it’s hard to believe they can fit over 100 people in that space. The pipes from the original organ are still on the back wall but they’re no longer used. The organ was rebuilt a number of years ago and the 3,000 pipes are concealed behind thin walls next to and above the original pipes. The “artwork” over the stage that serves to bounce and distribute the sound from the stage out to the audience looks light and airy. We were told it actually weighs seven tons. This is also where the chorus sits when they perform. The view of the entire room is terrific from here. 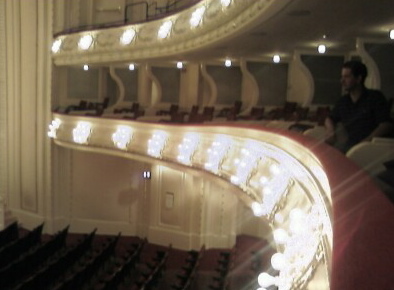 Our final stop on the tour was the box seats. While this is a kind of glamorous, movie set place to sit, with a good view and wide comfortable seats, the low overhang of the ceiling probably doesn’t do wonders for the sound. The boxes are narrow, like walking through a railway car, but plush, with comfy red velvet chairs, each with its own arm rests! 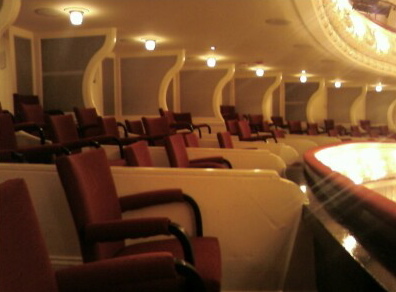 There are eight seats to a box, two per row with each seat slightly taller than the ones in front to give everyone a good sight-line. Since seats aren’t assigned, there’s an etiquette to sitting in the boxes, with folks in the front switching with those in the back at intermission so everyone has a chance at the good spots. Who knew. Wow! You get A+ on this report of the tour–great photos too. Am so glad I had gone to a concert there–this adds to my enjoyment.